Egyptians prepared to bury their dead and investigators pledged Thursday to work quickly to determine what caused the nation's worst train accident, a fire that killed at least 370 people. At Cairo's central morgue, where bodies from the site where the burning train stopped 60 miles south, crowds of relatives gathered Thursday. Some brought coffins to take their dead home for burial. The scene was calm, though stick-wielding riot police manned streets leading to the morgue in case grief and anger at the accident erupted into anti-government protests. Morgue officials allowed one member of each family inside to try to identify a relative, made difficult because many of the bodies were burned beyond recognition. By noon Thursday, 63 people had been identified. Abdel Atti Mohammed said he saw many bodies in the morgue that were ``only pieces of charcoal.'' He was able to identify his nephew, Mamdouh Ahmed Mohammed, 22, only because his identification card was still with the body. The elder Mohammed said his nephew had been working as a waiter in Cairo and his family had expected him to visit them in Sohag, 240 miles south for the major Muslim holiday of Eid al-Adha, or the ``Feast of the Sacrifice,'' which begins Friday. After hearing accident news reports, relatives called Mamdouh Ahmed Mohammed's friends in Cairo to learn he had been on that train. Several relatives took long distance taxis north to search hospitals, hoping to find the nephew among survivors. Mohammed Hassan searched six hospitals near the accident scene looking for his missing 58-year-old brother, Ali Hassan, who was returning to Sohag aboard the train. One place Hassan, 55, said he did not visit was the morgue, which offered him no hope of finding his brother alive. ``I don't want to go there, I've had experience there before,'' the Sohag native said without elaborating. Charred bodies of some 10-15 children were taken from the carriages, an eyewitness at the accident scene said on Thursday. ``The real reasons should be known as soon as possible,'' he said. While much of the government closed on the eve of Eid al-Adha, an official said investigators would be questioning survivors and railway officials around the clock. A possible cause of the fire was the explosion of a gas cylinder or small stove passengers often bring aboard to cook meals, despite regulations forbidding it. The fire began soon after the train bound for Luxor, 300 miles south, left Cairo about 11:30 Tuesday night. Some passengers died leaping from the speeding, burning cars. Even after halting near Reqa al-Gharbiya, strong winds kept the train burning for hours with scores of people trapped inside. The fire reached seven train cars. Ahmed al-Sherif, directoof the state-owned Egyptian Railway Authority, told The Associated Press Wednesday the train traveled in flames for four 2.5 miles. It was not clear why the emergency brakes were not applied immediately. Egyptian media quoted train driver Mansour Youssef el-Qams as saying he did not at first realize cars were on fire. 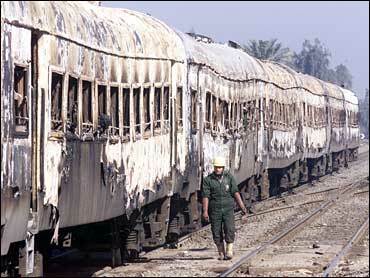 He told the Egyptian daily Al-Ahram that he managed to stop the train some 12 minutes after seeing flames. He said he heard no explosions before or during the fire. El-Qams said that after stopping the train he ordered his crew to separate the burning cars from the rest of the train, the Middle East News Agency said. An hour later, the rest of the train continued, leaving the burned cars behind and going on to Minya, 75 miles south, the driver said, according to Egypt's Al-Gomhuria newspaper. On Thursday, while official dailies highlighted government efforts to help victims' families, opposition papers lashed out at the government. The government announced 3,000 Egyptian pounds (about $665) compensation for families of the dead and 1,000 pounds ($222) for the injured, which did not amount to an admission of responsibility. The accident was the deadliest in more than 150 years of Egyptian railroad history and one of the world's worst train fires anywhere. In 1989, about 600 people were killed when a gas pipeline explosion blew apart two trains stopped in Russia's Ural Mountains.